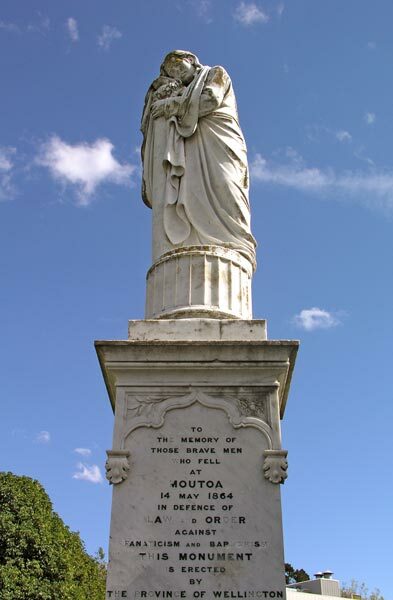 Mr Linklater said he considered it an honour to unveil the memorial in memory of the men from Moutoa who gave their lives in the Great War. New Zealand had a great record in the war which they should feel proud of. No memorial was necessary to remind them of the brave deeds, but it was necessary to remind the children for generations to come of what boys did in fighting in defence of the British Empire. Men whose names were inscribed on the tablet were lying dead in different parts of the world, but the sun never sets on the British Empire and that could be said equally of their boys who had died for their fellow men, country and God. He expressed admiration for the boys who left these shores and admiration for the mothers who sent their sons and the nurses who attended the sick and suffering. Mr Linklater then unveiled the memorial to the glory of God and in honour of the men who left these shores in defence of King and country. One minute silence was observed in memory of those who gave their lives. Mrs S Barber, who was in splendid voice, impressively rendered “The Requiem.” The Last Post being sounded by Bugler B Walls. At the close of the ceremony the chairman (Mr Verity) of the School Committee, gave an interesting address on how the funds towards this memorial were raised, and thanked Mr Linklater and visitors for their presence and assistance. A ladies’ committee then dispensed a welcome cup of tea to all present. The singing was lead by the school children, who showed that they had been well trained by their headmaster, Mr Aitken, and Mrs T Davey ably assisted at the piano. The committee were most fortunate in securing the services of Bugler Walls (Foxton), whose sounding of the Last Post left a lasting impression on the minds of all who heard him.